Excerpted from Mac/Eddy Today Issue #33. Article and photo copyright ©1987, 2005, all rights reserved. Lawrence Tibbett, Jr. contacted Sharon Rich after seeing her on a TV news show and agreed to be interviewed. His dad, of course, was the famous American baritone. Despite an imagined rivalry, Nelson Eddy and Tibbett, Sr. were friends in the 1930s, and also neighbors in the “flats” of Beverly Hills. Larry Jr.’s twin brother Richard was also interviewed. 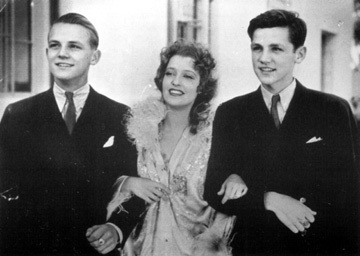 Above: Twin brothers Richard (left) and Larry Tibbett, Jr. (right) join Jeanette on the set of San Francisco (1936). LARRY TIBBETT: I was in the first picture [dad] ever did. My brother and I played little guys in the market in a picture called The Rogue Song. Let’s see, we were about 10 years old. SHARON RICH: What did your dad think of Louie B. Mayer? LT: I’m going to be honest with you. Nobody liked him. They hated him. He was an S.O.B. The only reason dad got the job was because Mayer’s secretary, Ida Koverman, just loved opera and she loved my dad. Dad got the first picture because of her, not Mayer. SR: That’s the same thing with Nelson. SR: You have a picture of yourself and your brother on the San Francisco set. Why were you there? LT: I don’t know why, unless it was close to where dad was working, and we went over to see it, as Gable was dad’s friend. I always liked Jeanette. SR: What did you think of Gene Raymond? LT: Gene Raymond was okay, he didn’t thrill me too much, I’m sorry to say….You know something? It’s true, they [Jeanette and Nelson] were in love…. [Her marriage] was just a set up. I don’t remember any madly in love or any of that stuff…. But didn’t Nelson marry someone else? SR: Both of them did. After Jeanette married, Nelson got drunk and eloped. Did you ever hear that? LT: Yes, I did. I know Nelson got married to someone he wasn’t in love with. SR: How’d you know that? LT: Because it was discussed in the family, discussed at home. Everyone was upset about him marrying her, no one liked her. LT: No, I remember that, when they said he was gay. He definitely was not….Gene Raymond? Oh yeah, I knew that! LT: Oh, of course! I know all of ’em who were–I knew them all, being an ex-actor. Like Cesar Romero and Janet Gaynor. Gene drank too. I know everyone who drank and who didn’t. I hate to say it, my dad did, unfortunately. But he still was a genius. SR: Well, homosexuality is kept very hush-hush within the industry. The public is generally unaware. LT: Oh, yeah, I knew he was double-gated, and I knew it at that time too. See, because of that I think that’s why they thought Nelson was switcheroo, but he wasn’t…. I would have brought that up [about Gene] but I was kind of afraid to say anything. But you do know, you’ve done your homework.